Blue Gum | Infonet Biovision Home. 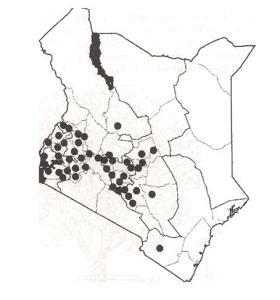 Giriama: Kamba (Musilikini); Kikuyu (Mubao, Munyua mai); Kisii (Omoringarnu); Luo (Bao); Swahili (Mtimbao). It is native to Australia and is widely planted in the tropics. In Kenya, is the dominant gum grown in the highlands. The species should not be planted near crops as yields are adversely affected. This is a good tree for woodlots. It is an important general-purpose hardwood in Australia, and is favored for construction, flooring, cladding and paneling. In Kenya, is the dominant gum grown in the highlands, 1,200 - 2,400 m. It will grow in all but arid areas or those infested by termites. Does well in agro-ecological zones I - III. Fuel: source of firewood and charcoal. Apiculture: Sidney blue gum is not reliable as a honey producer. It is however useful in stimulating colonies and may be helpful in queen-rearing and re-stocking programs. The honey is strongly flavoured, rather dark and frequently lacks density. It does not store well. Fibre: Young, fast-grown trees are used for semi-chemical pulp. However, when E. saligna is grown slowly, the heartwood may become difficult to process. Timber: The heartwood is red or pink, hard, stiff, coarse textured, usually straight grained, moderately durable, is easy to work and polishes. Essential oil: is essential for oil yields. The major compound found in E. saligna is alpha-pinene. Reclamation: E. saligna is widely used in reforestation. Natural forests may be severely damaged by psyllids of the genus Spondyliaspis, and the weakened trees may then become more susceptible to attack by the wood borer Xyleborus truncatus. Larvae of Phoracantha semipunctata have caused wood degradation in young plantations in Western Australia. 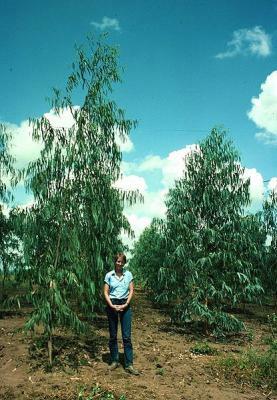 Plantations in northern New South Wales have suffered little from insect attack. However, in scattered patches throughout the coastal area, E. saligna has been killed off by die-back disease. In the nursery, damping-off fungi such as Pythium spp. and Rhizoctonia spp. can reduce seedling survival. E. saligna is resistant to the root rot fungus, Phytophthora cinnamomi.